3.75 Stars? I know it’s a strange rating, but I couldn’t decide between a 3.5 and a 4. 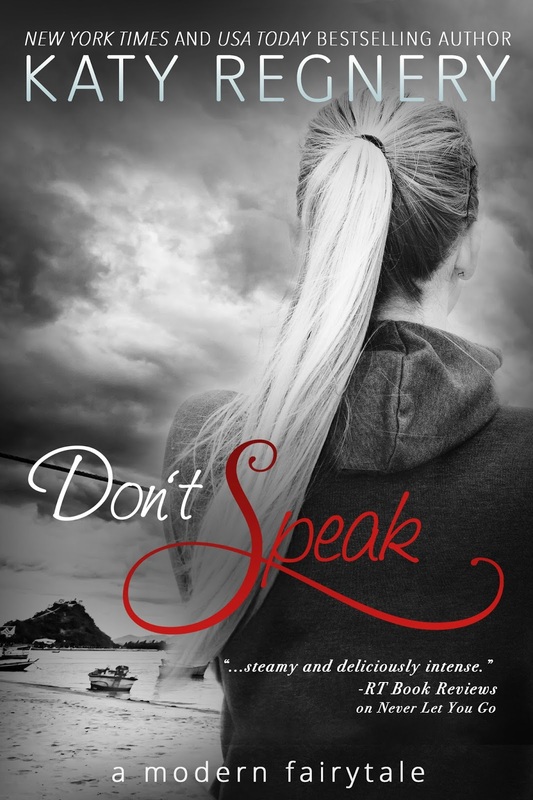 I debated on reading this because I don’t generally read hockey romances. I live in Texas, and it’s hot here, there is no ice and football is king. Hockey is foreign to me. BUT I read my 1st Julie Cross book last year and absolutely fell for her writing. I’m glad I tried this one. I think it’s a solid start to a series and I hope to see more books in it soon. I have never connected so deeply with a couple in such a short time.This is how you write a prequel. I don’t think anyone could read this and not feel this story. Flow is the prequel to Grip which is releasing March 2nd. This is a cliffhanger, but not too bad since we get the conclusion in less than a week. Flow is free right now, and I’m not sure how long that is going to last. I do know that if you love it you can preorder Grip for $0.99 before it goes up in price on release day. 3AM is when I finally went to bed last night. Lack of sleep is generally how I judge books and this one kept me up to a completely indecent hour. 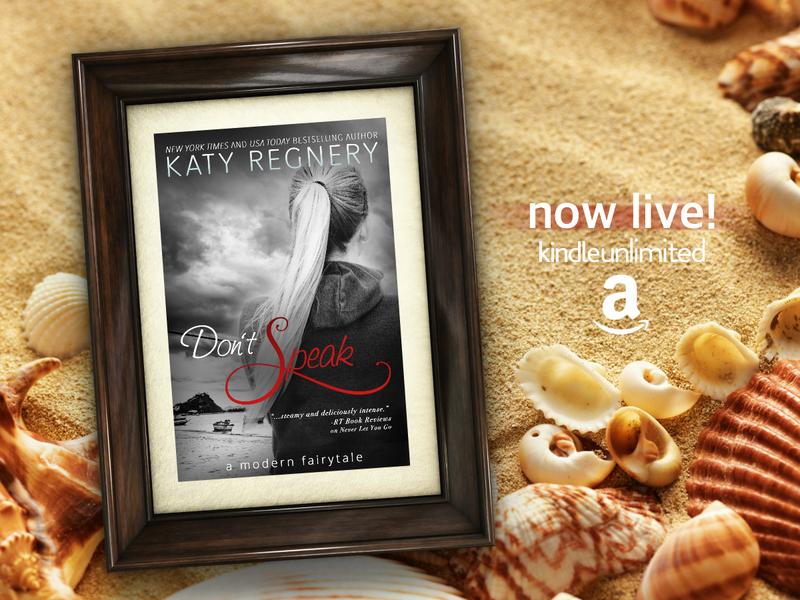 Don’t speak is the 5th book in Katy Regnery’s a modern fairytale series. This is one of those series where you absolutely don’t have to read the books in order. They are completely unrelated so you can jump in and out of the series wherever you wish. This is the only book I’ve read in this series but I’ll definitely be reading more of them. The 1st book, The Vixen and the Vet, is currently free on Amazon so I’ll probably be reading that one next. About the book? It’s supposed to be a retelling of The Little Mermaid, but I haven’t seen the movie since early childhood and never read the book. While reading I didn’t know how close the story was to either of those versions other than them being from completely different worlds. I did a bit of “research” after reading it and can completely see the similarities… and now the title makes sense too. This book took awhile for me to get into and that detracted a bit from my enjoyment. 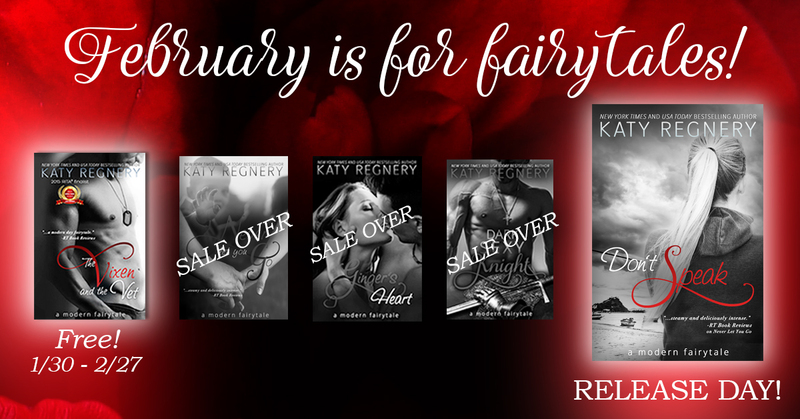 I didn’t realize it was a second chance romance, so the plot felt like it was progressing too quickly without allowing you to really fall in love with their story. I didn’t get invested until about 40% through, but once I got there I couldn’t put it down. From their first date, you know what the main problem in their relationship is going to be aside from their differing backgrounds. From that point on you are constantly waiting for it to blow up… and it does blow up… at the absolute worst time. I loved how this book turned out and now I just feel all happy and sigh-y about it. I forgot to add that 10% of the e-book sales for in March and April 2017 will be donated to charity. THAT made me happy. This isn’t one of my normal genres, but I’ve been trying to expand my tastes. I won I See You in a giveaway and was completely shocked to see it show up at my door. I don’t read many physical books, but sometimes it’s nice to actually hold a real book. 1. too many similar female names Kelly, Katie, Cathy led to some minor confusion while reading. 2. I didn’t believe the chain that led to Kelly figuring it out. It seemed too “out of thin air” for me. For me, this was a pleasant step into the genre and I think I’ll be reading more of this type of book. Does anyone have any recommendations for books in the mystery/thriller genre that won’t make me afraid of the dark? I would really like to try more books in this area… but my overactive imagination makes me scare easily. Damage Control is finally releasing today. It’s only been a little over 6 months since Hard Rules was released, but the cliffhanger on that one was so brutal that the wait for this sequel has felt like much longer. Damage Control starts exactly where Hard Rules left off. We finally find out Emily’s secrets and there is A LOT we didn’t know. I’m in the minority on this, but I felt like after the bombshell reveals at the beginning, the book slowed down quite a bit. That isn’t to say that there isn’t a lot going on, but it’s almost like there is so much going on that I felt less invested in the story.The story definitely revs back up for the last 20% and left me once again, wanting more. Bad Deeds comes out August 8th, and I’ve already preordered it because I need to know what happens next. If you haven’t already started the series you DEFINITELY need to start with Hard Rules first. This isn’t my normal genre, and I’m not really a Trevor Noah fan but neither is required for this to be a really enjoyable book. It was funny, touching, and educational all rolled into one. By “not a Trevor Noah fan”, I don’t mean that I dislike him, more that I have very limited knowledge of him. I’ve seen parts of his show, but never a whole episode. I listened to Born a Crime on Audible and believe that added to the enjoyment, because listening to Trevor Noah narrate his own life was a treat. The voices were phenomenal and he really has a talent with storytelling. I’m ashamed to admit that I had very little knowledge of apartheid prior to reading this. I learned so much and enjoyed myself while doing it. Gilded Cage by Vic James is the first book in her Dark Gifts series. This book has such a great atmosphere full of political intrigue, magic, and rebellion. She said that the initial arc is intended to be a trilogy but she does see room to expand the story to more books if she feels it is needed. I love the way it looks like these books are going and I will happily read three books. I am a bit apprehensive about it going past more than that, because ultimately I want a happily ever after ending. I want the Slave Days to be abolished and everyone to live together peacefully. Can that happen… PLEASE?! This world is dark. I read this at the same time I was reading Six of Crows, and I had a bit of trouble distinguishing the worlds at first. Not because they are similar in a detailed way, but it is more the feeling you get while reading. My favorite character is Silyen with his smart and powerful creepiness but I also loved the direction Luke’s character took. And then there is Renie. She is perfect but I have been scarred by dystopian writers that always seem to kill off my favorite characters. I worry she has a huge target on her back. There were definite plot twists that I never saw coming, and I’m sure the next book will have many more. I’ll definitely be reading the next book as soon as I can get my hands on it. Gilded Cage is in stores TODAY.